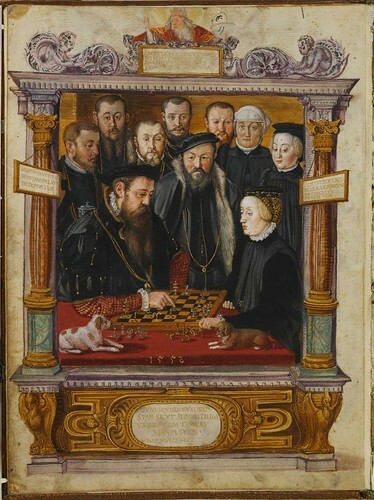 Puppies and members of the royal court look on as the serious Duchess Anna and Duke Albrecht V of Bavaria face each other across a chessboard. We can only speculate as to why such a modest scene was chosen as a prelude to an album recording, in stark contrast, the ostentatious display of wealth from their marriage and position in society. 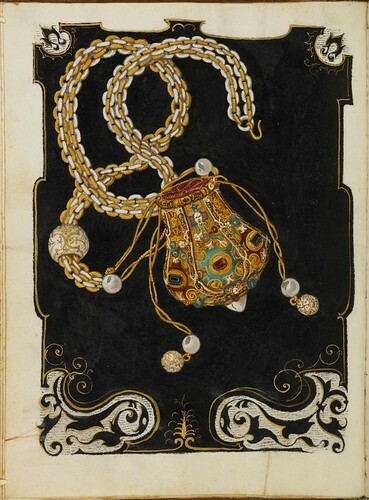 Perhaps they wished to stress that, in spite of the precious stones and extravagant jewellery in their possession, their lives were driven more by intellectual pursuits than by the mere trappings of office? But when we look closely, the attendants aren't even watching the game, are they? Well, one is at least, the chap on the left, and perhaps another; the rest of them appear to have their eyes (and thoughts?) diverted from the issue presently before the crown. Is there an inference here about a lack of trust or treacherous shenanigans afoot? I have no idea. What say you Wikipedia? "Albert was educated at Ingolstadt under good Catholic teachers. 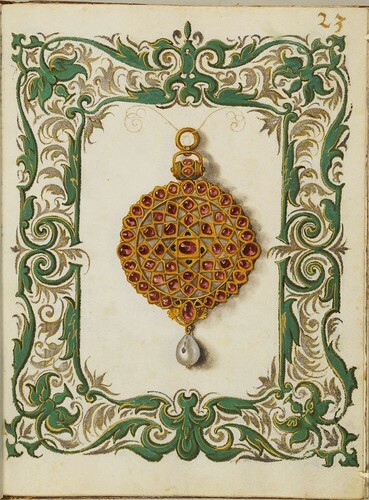 In 1547 he married Anna von Habsburg, a daughter of Ferdinand I, Holy Roman Emperor and Anna of Bohemia and Hungary (1503–1547), daughter of King Ladislaus II of Bohemia and Hungary and his wife Anne de Foix, the union was designed to end the political rivalry between Austria and Bavaria. Albert was now free to devote himself to the task of establishing Catholic conformity in his dominions. A strict Catholic by upbringing, Albert was a leader of the German Counter-Reformation. 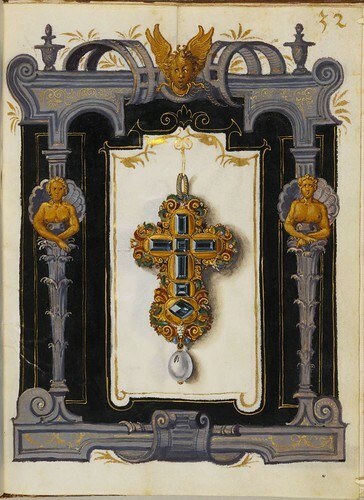 Incapable by nature of passionate adherence to any religious principle, and given rather to a life of idleness and pleasure, he pursued the work of repression because he was convinced that the cause of Catholicism was inseparably connected with the fortunes of the house of Wittelsbach. 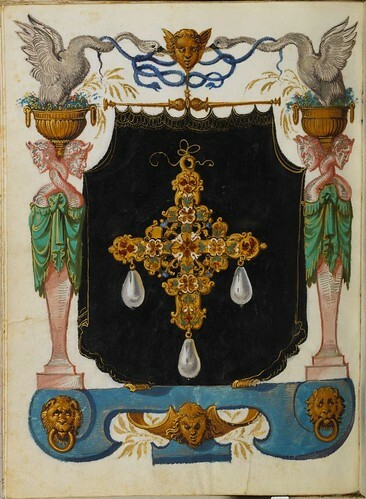 He took little direct share in the affairs of government, nevertheless, and easily lent himself to the plans of his advisers, among whom during the early part of his reign were two sincere Catholics, Georg Stockhammer and Wiguleus Hundt. The latter took an important part in the events leading up to the treaty of Passau (1552) and the peace of Augsburg (1555)." 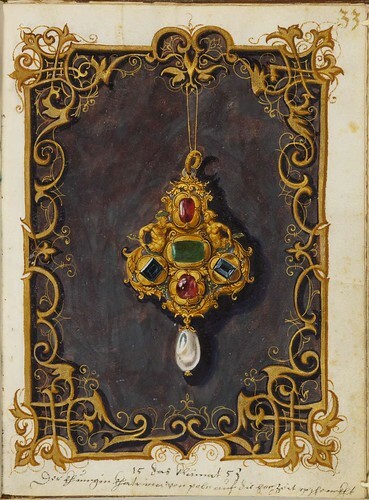 The paper and parchment manuscript displays more than one hundred gouache sketches of seventy pieces of jewellery, the vast majority belonging to Duchess Anna and the remainder to the Duke. 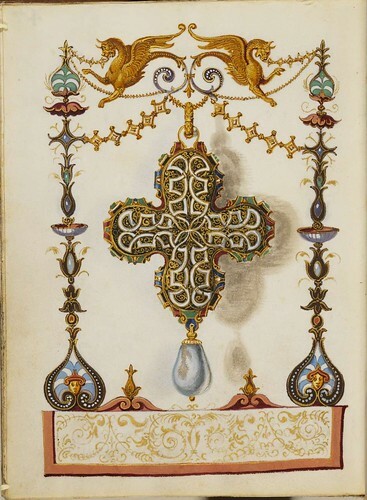 Mielich spent at least two years preparing the sketches and the work was completed in 1555. 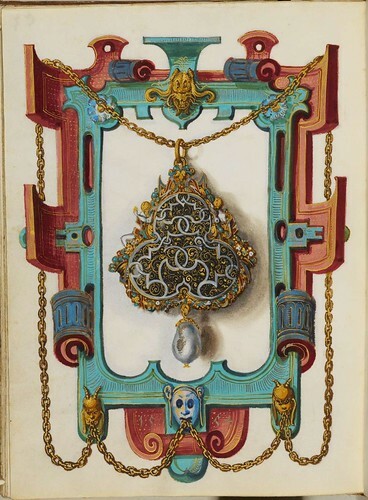 To be honest, my attention was primarily drawn - at first - not to the jewellery itself, but to the borders and frame decorations. 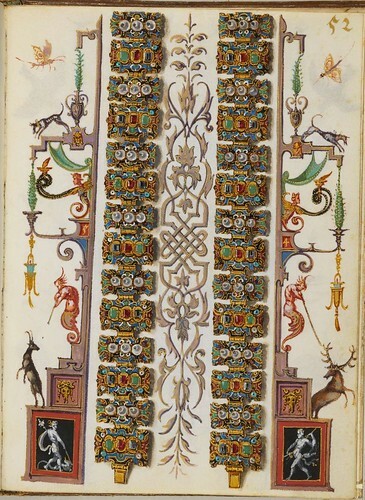 It's essentially a parade of Renaissance and classical motifs featuring strapwork, grotesques, caryatids, arabesques, cartouches, foliage and the occasional animal and trophy. 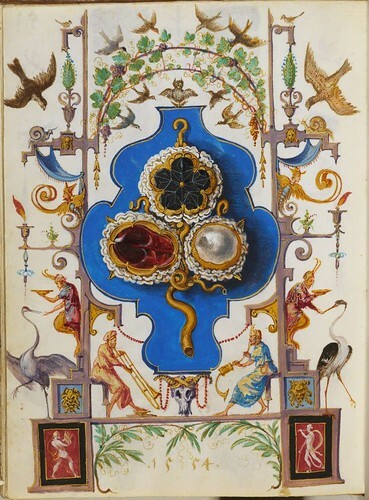 Bearing in mind that the above selection is just a sampling, the manuscript as a whole offers a dizzying array of these decorative forms. 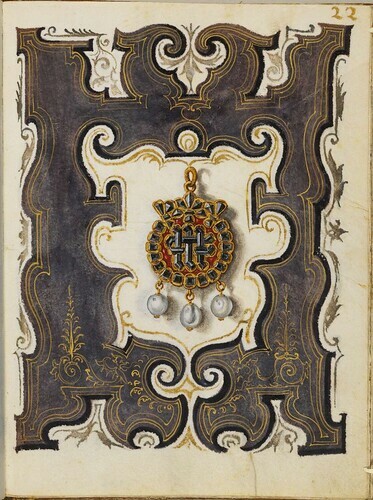 The jewels themselves are exquisitely detailed. 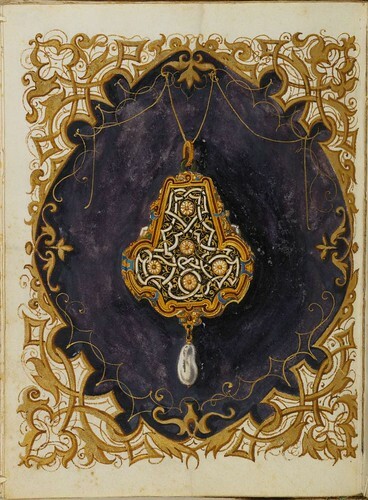 It may have taken me a while to warm up to it, but this really is a gorgeous manuscript. 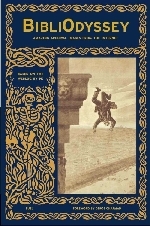 The catalogue entry has background on the manuscript (in German) [trans.]. I've also lately set up a store on Amazon which is slowly being populated with some choice titles. It's worth a browse. On the left, Uxor tua sicut vitis abundans in lateribus domus tuae, "Your wife is as a fruitful vine on the sides of your house" and on the right filii tui sicut novella olivarum in circuitu mensae tuae, "Your children are as a branch of olives around your table," both of which comprise Psalms 127.3, Vulgate. 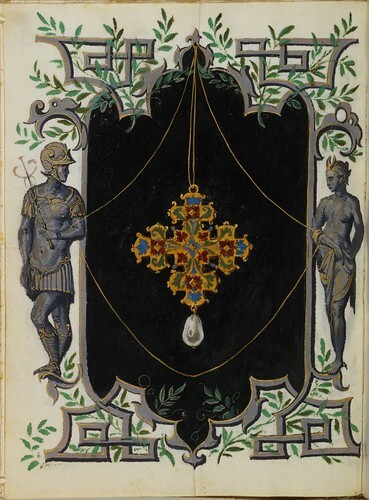 On top, Propter hoc dimittet homo patrem et matrem et adherebit uxori suae et erunt duo in carne una, "For this cause shall a man leave father and mother, and shall cleave to his wife, and they two shall be in one flesh" (Matthew 19.5, Vulgate). On the bottom, it's a little harder to see, but it looks like Unusquisque uxorem suam sicut seipsum diligat uxor autem timeat verbum(?) suum. Hans Muelich fecit(?). "Whoever will guard his wife like himself, his wife will fear his word. Hans Muelich made [this]." Thanks Kevin, that was fast. Seems I was musing too literal and it edges more allegorical. I admit my favorite page is the chess scene. But I do find it a little hard to believe that the pups are so well behaved on the table and not moving any of the chess pieces. I was truly moved by the art here, and all of it was done with only bare hands and a brush. I am shamed that I cannot do half as well with a computer. The chess game had a wide diffusion during Renaissance. It was introduced in Italia by the arabs who knew it from the persians and indians. 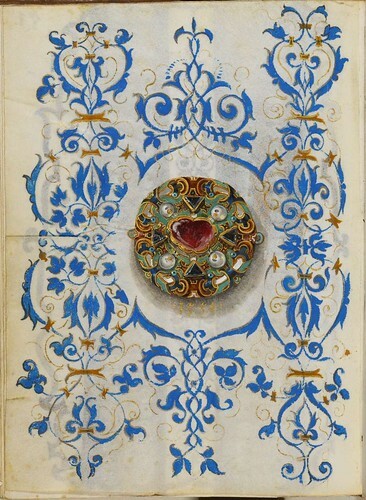 In the Renaissance it was a metaphor of the World. So, contemporaries of the manuscript have the objective knowledge to interpret the staging representation. 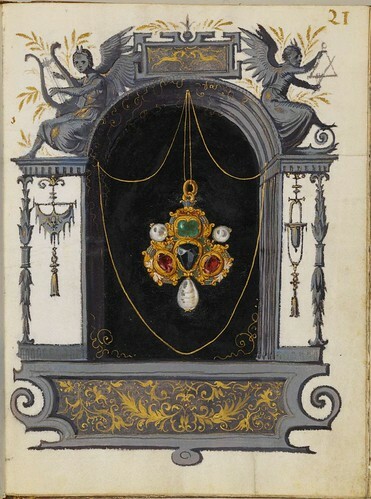 I think that we have here a scene representing the power and wealth of a couple that was given by god, and illustated by the latin inscriptions. 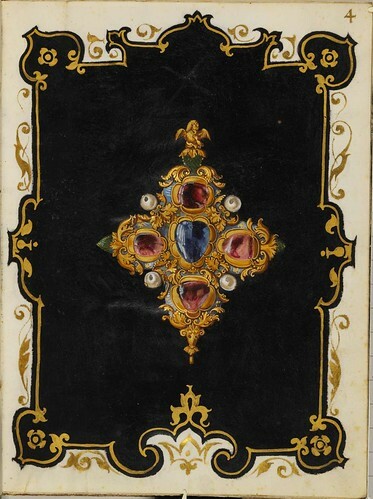 The jewels are the signs of the couple's power and the book should be then the same as photos are today. You're very welcome, Peacay! It was fun to do. That jewelry is exquisite. Some of it very much reminds me of the contemporary Fedorov workshop in St Petersburg. 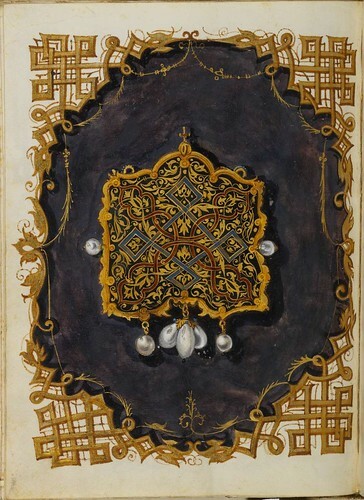 Judging from the inscriptions, I wouldn't be surprised if the book was created to celebrate their wedding or an anniversary thereof, and that the images of jewelry were gifts to the Missus. I would think the chess game should be seen just as we would understand such a scene today: a meeting of intellectual equals. The bystanders would likely have been witnesses to the weddding. The two distinguished gentlemen in the center are likely the "Georg Stockhammer and Wiguleus Hundt" mentioned in the Wikipedia entry. This made me think of the modern practice of photographing the family valuables to aid in identification if they should be stolen! 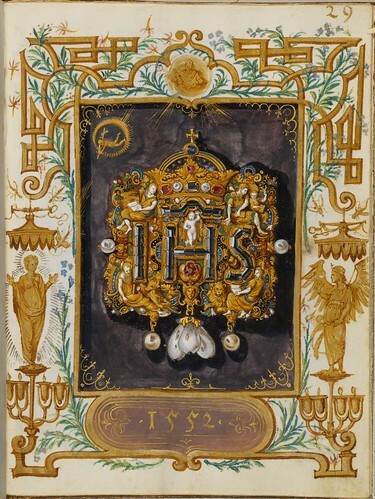 Somehow I wasn't entirely surprised that such a magnificent volume should be created for the Habsburg dynasty - the family of the Holy Roman Emperor (i.e. empire builders to a man). A number of these have a grey-black background that looks more faded than other colors. Perhaps it was a fugitive color like vermillion. I thought it might be because a couple of cherubs had dark marks on their faces that might have been rosy cheeks. I found a reference to this book in "Medieval Clothing and Textiles 2". 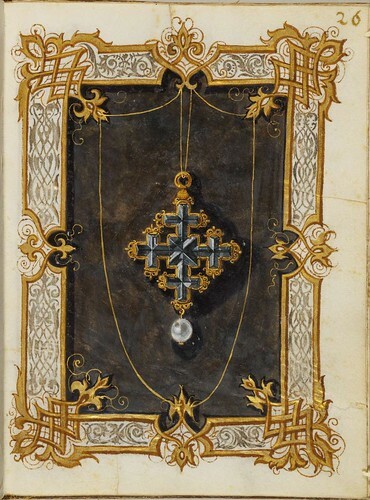 It mentions that one of the pieces depicted is a jeweled fur piece (zibellini). 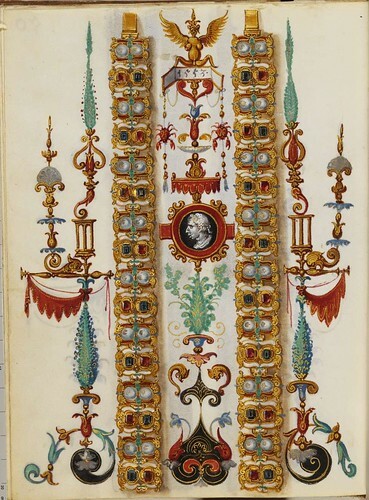 The Bavarian State Library link above is broken...do you know of some other place I can find this picture? My very very very very strong feeling is that this is a temporary glitch. I cannot believe that such an important site has just upped and moved all their data without forwarding mechanisms. So I suggest trying again tomorrow. I have a very large % of the images saved locally and the 'fur' rings a bell but I've just gone through them and it seems I must have deleted it. Sorry about that. It was very hard trying to compile a representative sampling! Well. I'm a bit annoyed/shocked to find that they (Bavarian State Library) have, in fact, changed the URLs. I've updated the link to 'Kleinodienbuch' above. 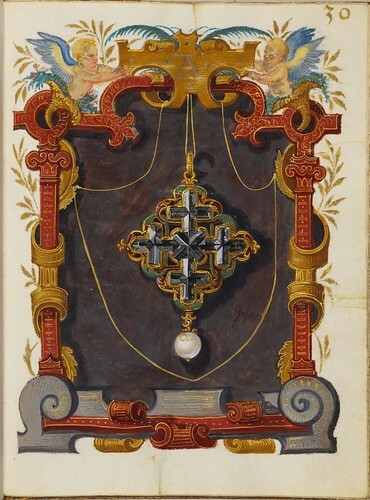 If you look at the Digital Collection page (jog down to 'Codices Iconographici'), the 'collection homepage' leads to a dead-end, but the 'Liste' link works. I wonder if we are just seeing them halfway through a system update. I'm going to try to email *someone* because there are, I think, tens of posts from that collection hereabouts. Still, it's very strange. It is among the largest online collections of digitised books & manuscripts in the world and this hiccup is completely out of character from their usual exemplary hosting operation. They (staff at BSB) tell me that the URL problems are only temporary.